In this chapter we will explore the states of matter and then look at the kinetic molecular theory. Matter exists in three states: solid, liquid and gas. We will also examine how the kinetic theory of matter helps explain boiling and melting points as well as other properties of matter. All matter is made up of particles. We can see this when we look at diffusion. Diffusion is the movement of particles from a high concentration to a low concentration. Diffusion can be seen as a spreading out of particles resulting in an even distribution of the particles. You can see diffusion when you place a drop of food colouring in water. The colour slowly spreads out through the water. If matter were not made of particles that are constantly moving then we would only see a clump of colour when we put the food colouring in water, as there would be nothing that could move about and mix in with the water. Diffusion is a result of the constant thermal motion of particles. In 1828 Robert Brown observed that pollen grains suspended in water moved about in a rapid, irregular motion. This motion has since become known as Brownian motion. Brownian motion is essentially diffusion of many particles. Brownian motion can also be seen as the random to and fro movement of particles. The temperature at which a solid changes its phase or state to become a liquid. The process is called melting. 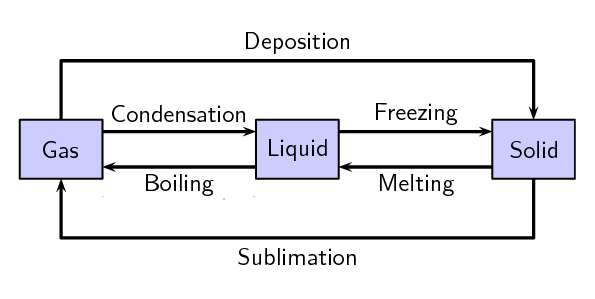 The temperature at which a liquid changes its phase to become a solid. The process is called freezing. Evaporation is the process of going from a liquid to a gas. Evaporation from a liquid's surface can happen at a wide range of temperatures. If more energy is added then bubbles of gas appear inside the liquid and this is known as boiling. Condensation is the process of going from gas to liquid. Sublimation is the process of going from a solid to a gas. The reverse process is called deposition. Deposition is the process of going from a gas to a solid. The reverse process is called sublimation. If we know the melting and boiling point of a substance then we can say what state (solid, liquid or gas) it will be in at any temperature. To investigate the heating and cooling curve of water. Place some ice in a beaker. Measure the temperature of the ice and record it. After 1 minute measure the temperature again and record it. Repeat every minute, until at least 3 minutes after the ice has melted. Plot a graph of time versus temperature for the heating of ice. Heat some water in a beaker until it boils. Measure and record the temperature of the water. Remove the water from the heat and measure the temperature every 1 minute, until the beaker is cool to touch. Be careful when handling the beaker of hot water. Do not touch the beaker with your hands, you will burn yourself. Plot a graph of time (independent variable, x-axis) against temperature (dependent variable, y-axis) for the ice melting and the boiling water cooling. You should find that the temperature of the ice increases until the first drops of liquid appear and then the temperature remains the same, until all the ice is melted. You should also find that when you cool water down from boiling, the temperature remains constant for a while, then starts decreasing. In the above experiment, you investigated the heating and cooling curves of water. We can draw heating and cooling curves for any substance. A heating curve of a substance gives the changes in temperature as we move from a solid to a liquid to a gas. A cooling curve gives the changes in temperature as we move from gas to liquid to solid. An important observation is that as a substance melts or boils, the temperature remains constant until the substance has changed state. This is because all the heat energy goes into breaking or forming the bonds between the molecules.